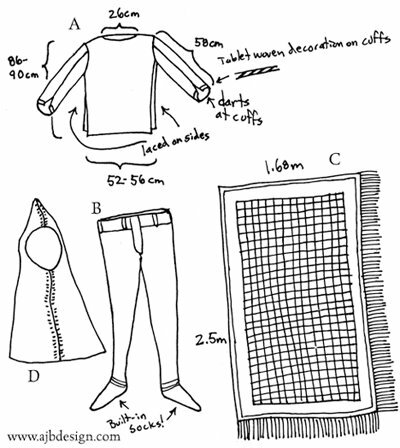 The above image is a reconstruction of the clothing found at Thorsburg. The clothing of the Iron Age British, Gauls, and Germans was quite similar in style. Evidence for what they wore comes from sculpture, archaeology and the writings of Greek and Roman authors. In order for organic material such as clothing to survive special anaerobic conditions must be met. Perhaps the most complete find is the material from Thorsberg in Schleswig-Holstein. A near complete ensemble was discovered in a peat bog in the 1860s. The clothing is considered to be German and from no later than the 3rd century AD. Ancient fashion changed very little over the centuries, so one may cautiously use this find to better understand the clothing of the Iron Age to early Roman period. The wool tunic found at Thorsberg was made from a single piece of cloth. It has a diamond twill weave. The tunic was 52-56 cm wide, 86-90 cm tall. The neck hole was 26 cm wide. Each sleeve was 58 cm long. It was laced together on the sides. the seem of the sleeves was on the back (Wild). It was dyed red with purple tablet-woven ornamental bands around the cuff (Sumner). The Thorsberg trousers were also wool, but undyed. It is a diamond twill. They were made with belt loops and built-in socks(Wild)—much like modern-day childrens’ pajamas! They were tailored to fit the body, which confirms Tacitus' assetion that the Germans wore tight pants. (Tacitus) So, their pants were form-fitting, but they could not have been too tight. They would need to have been loose enough to allow full movement on the battlefuield. Modern re-enactors have had trouble with tight trousers splitting a seam! The Gauls are thought to have worn more loosely fitting straight-legged trousers. I am currently trying to find an archaeological basis for that. The Dacians on Trajan’s Column are depicted wearing fitted trousers, but it appears that their pants were straight legged and tucked and bound at the ankle, rather than tailored to fit the form of the leg. The Thorsberg woolen cloak is 1.68m x 2.5m. It is a plain twill with a blue check pattern (Wild). John Peter Wild describes the cloak as having three shades of blue, but Graham Sumner reports it as having only two. In Germania Tacitus described the German cloak as being fastened with either a metal clasp or a simple stick or thorn. Dyes were made from natural sources. Woad and madder are good examples of plants producing dyes—blue and orangish-red respectively. Natural dyes tend to be more muted than modern chemical dyes—especially when the fibres being dyed aren not bright white. 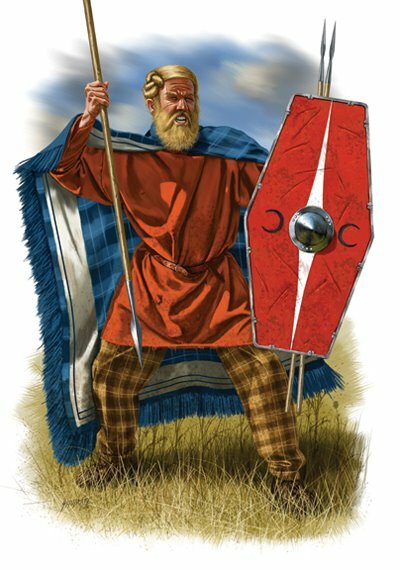 Diodorus Siculus states the Celts wore striking clothing, their tunics dyed and embroidered with many colors. He wrote that the Celtic cloaks were in a mixed close-set check pattern. The above mentioned fabric from Hallstatt had ’a rectangular pattern of bands of black or dark brown wool, which was reminiscent of a Scottish tartan.”(Glenys) Cassius Dio wrote of Boudica’s multicolored tunic. 1. Lloyd-Morgan, Glenys. “Appearance, Life and Leisure” in Green, Miranda J. The Celtic World. Routledge 1996. 2. Jones, Martin. The Environment of man: The Iron Age to the Anglo-Saxon period (BAR British series) 1981. 3. Sumner, Graham. 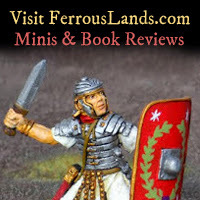 Roman Military Clothing (2): AD 200-400 2003 Osprey Publishing, Ltd.
4. Wild, John P. “The Clothing of Britannia, Gallia belgica, and Germania inferior” in Aufstieg und Niedergang Welt II 12.3. New York 1985.